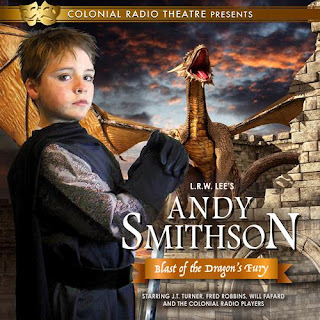 The Colonial Radio Theatre on the Air recently released a dramatization of the first book in the Andy Smithson series; a children’s fantasy series by L. R. W. Lee. It’s called Andy Smithson: Blast of the Dragon’s Fury. I had never read nor heard of this series before finding out that CRT was dramatizing it. This review is only over the radio dramatization. I haven’t read all of the first book or the following books so I only know the contents of this audio presentation of it. This is my first introduction to this series so I have a lot of thoughts on it. First off, here’s a summary of this story. In Blast of the Dragon's Fury, an otherworldly force draws him into a medieval world where fire-breathing dragons, deranged pixies, and vengeful spirits are the way of things. Trading his controller for a sword of legend, Andy embarks upon an epic quest to break a centuries-old curse oppressing the land. It isn't chance that plunges him into the adventure though, for he soon discovers ancestors his parents have kept hidden from him are behind the curse. There’s a lot of humor in this story. A lot of the humor comes from the differences between Andy’s world and the land of Oomaldee. For example, King Hercalon and his magician, Mermin, mistake Andy’s mailbox as a magical thing called the Us Pus box (USPS). Also, Mermin speaks like Elmer Fudd. For example, instead of saying “promised,” he says “pwomised.” Unfortunately, there are a couple instances of some low-brow humor mixed in as well. There were a few times that I almost wished there was a narrator to help explain a few of the things happening in the drama. There are several times where Andy hears different unearthly voices that it gets a little hard to keep track of who is talking. However, it wasn’t that difficult with the rest of the story. I commend the CRT team for doing a good job adapting a very visual book to audio without using a narrator. Even with this being a more secular fantasy story, there are some Biblical themes and parallels in this story. There is a scene where a voice calls to Andy at night and what follows is very similar to the way God called to the young Samuel in the Bible. Andy learns to take responsibility for his actions (after being very irresponsible several times) and finally tells the truth about an accident of his own making. The idea of being chosen for a special purpose by an unseen powerful spiritual being is also reminiscent of God choosing certain people to perform certain tasks. A voice encourages Andy that he was chosen to break the curse “for such a time as this” which is a quote from the book of Esther. The folly of pride and revenge is shown as well. However, as this is a secular story based on a modern book, there are some words and phrases used by some of the characters, including Andy, that some parents may not want their children repeating. There are just a few of these scattered throughout, but they are there. There’s also a pretty insulting name that is used by someone. Also, if you’re wondering about how the magic in this fantasy story is used, I’d say the magic aspects are more akin to Disney fare. Ghosts, dragons, and a curse are all a part of this story. With a story of this epic nature, it definitely needs some great sound effects to paint the picture of this other world in our minds. Most CRT productions have fairly sparse sound effects as is the intention to harken back to Old Time Radio and the live theatre setting. However, I think there were a little more sound effects in this drama than any of the other productions that I’ve heard from CRT. The battle with the dragons stands out in my mind as a perfect example. I believe Andy Smithson has the best sound design of the handful of CRT dramas I’ve heard. This drama contains the third score that Jared DePasquale has composed for Colonial Radio Theatre. I have to say that the music with its fantastical elements is some of the best he’s made for any radio drama! Jared’s score for The Trials of Saint Patrick for AIR Theatre had some fantastical-sounding elements in it, but his score for Andy Smithson has it all. The flutes, oboe, English horn, clarinet, celesta, and others all come together to make a fun and mysterious score to go along with the story. If you want to hear the score for this drama, you can hear cues on Jared's website or some select highlights on his YouTube channel. Some of the best acting comes from the drama’s star Will Fafard as Andy Smithson. J.T. Turner gives an excellent performance as the funny Mermin. Fred Robbins as King Hercalon gives the character the wisdom and warmth that made me really like his role as the wise mentor. I was kind of surprised that Jerry Robbins did not lend his voice to any characters in this production. I’m not sure if this is the first drama from CRT that he hasn’t been in, but I believe it’s the first one of the ones I’ve heard without him in it. However, Jerry Robbins did host the drama and directed the actors. I have to say I really did enjoy this production. The music, sound effects, story, and acting all came together to make a fun drama. The story is wrapped up to a certain extent but leaves a lot to be explored in future stories. I’m looking forward to hearing the next installment of this series! That said, Andy Smithson: Blast of the Dragon’s Fury isn't for everyone. Parents should preview it for their kids so they can decide whether or not it's suitable for them. Like any other radio drama, I think parents and kids should listen together so they can discuss the themes and messages in it. As for my personal verdict, my rating for this production would be 4 stars out of 5.